You’ll have to trust me on this one, but I’m writing this with a scowl. While everyone else is giddy with anticipation over the approaching warmth, we rinkbuilders are left with the saddest of sights: our new home-made reflecting pools. It was only weeks ago that these pools were host rinks for family parties, neighborhood get-togethers, and intimate one-on-ones between fathers and sons. Now? They’re the world’s largest bird baths. 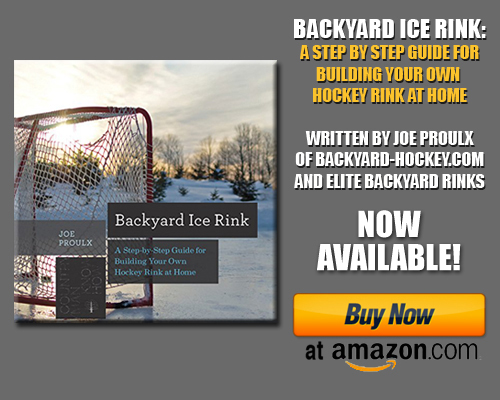 What we’ll talk about today are the essentials of the rinkbuilder’s springtime to-do list: the drainage, the teardown, and the storage of your backyard rink. A quick side note on something I learned about from my buddy Scott. Each spring he takes a ziplock baggie of thawed rink water and puts it in his freezer. 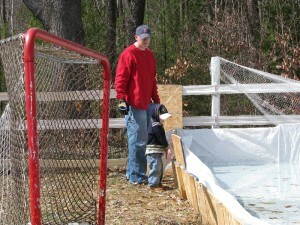 Then each fall on fill day, he puts that frozen chunk of ice back into his rink — a passing of the torch, in some ways. I’ve done it for a few years, forgetting once in the spring of 2011. Of course, that fall and winter was our worst season ever. Here’s a FB pic of my kids putting the chunk into last fall’s water. Our new house presents a bit more of a challenge. For one, it’s situated on a tennis court, so there’s really no place for the water to go directly beneath the liner. Second, the areas immediately surrounding the court (where the water would likely end up) is usable yard that we’d like to keep from turning into a mud pit. So these days we use a small, inexpensive submersible pump (like this unit from Amazon.com), which connects to a standard garden hose and acts like a sump pump to direct the water elsewhere. We have somewhat of a marsh towards the back of our property, which is be easily reachable by a 50′ hose. The rink’ll be empty, and my neighbors won’t need waders to BBQ. Win win. You can also skip the pump and use a natural siphon if your yard slopes the right way. Siphons work by using hydrostatic pressure (and other big, intimidating words) to create a natural flow from one place to another. The catch is that the destination must be LOWER than the source. If your rink sits atop a plateau in your yard, and you have a drain or basin that sits down a hill, you might be in business. 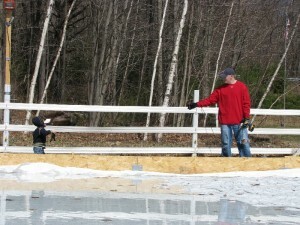 If your rink is at the lowest point in your yard, you’ll need a pump. 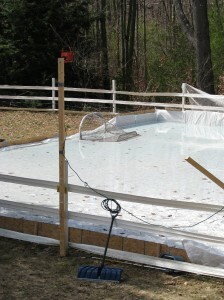 Once your rink has been drained, it’s time to dispose of the liner. If your rink is large, then your liner can be beastly. Don’t try to fold or roll it up like when it was new. Instead, level the playing field with a pair of heavy-duty scissors or a utility knife. The goal is to slice your liner up in to manageable strips, which you can then roll up, tie into bundles, and dispose of. Alternatively, if you’re down with green movement, I’ve heard stories of folks reusing old rink liners to cover boats or donating them to folks in need of large tarps, to cover wood piles and such. There are probably hundreds of uses for an old liner if you’d rather not throw it away. I’d be curious to hear what everyone else does — post your approach in the comments. If you’re going to leave your rig outside for the summer, as I have, know that the sun and elements will take its toll. Even if you don’t have a structure in which to store your boards and stakes, covering them with a tarp (your liner, perhaps?) will at least keep them out of the rain. And unless your wooden boards are stained and sealed, you really don’t want them soaking up water all summer. Know that indoor storage is preferable to outdoor, but if you must leave ’em out, at least cover them. As I have stated before, one of the nice things about making a “rink” on pond ice, is in the Spring that Mother Nature does most of the cleanup for me…..my snow “boards” melt-away and no liner to drain and drag to the curb. Sure, I have to drag the lights, the chairs and the fire pit back to the house, but that nothing. Agreed that this is a sad time of year for backyard rinks and pond hockey. Just about every morning, I look out my side window at “The Pond” and sigh. Bigger and better next year though!!! AWESOME post…..thanks SO much for the creative insight!! 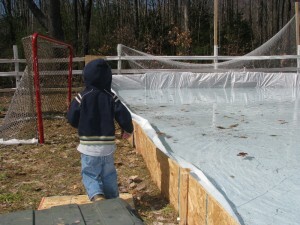 What is the right way to store a plastic ice rink liner? Does it need to be completely dry before it’s folded and put away?